It’s time to start stocking up on gifts for Christmas on Amazon! Lego is a fun one, and you don’t EVER have to pay full price if you know what you are looking for and willing to shop around. Hurry and get the LEGO Star Wars Bounty Hunter Speeder Bike Battle Pack 75167 Building Kit today for only $11.79 from Amazon (regularly $14.99)! Check out all of the recent Amazon deals here! Get Dengar, Bossk, IG-88 and 4-loom on the move with their own custom bounty hunter Speeder bike. With striking blue elements, two stud shooters and space on the back for a backpack, this Speeder bike battle pack will send your LEGO Star Wars toy adventures into OVERDRIVE! 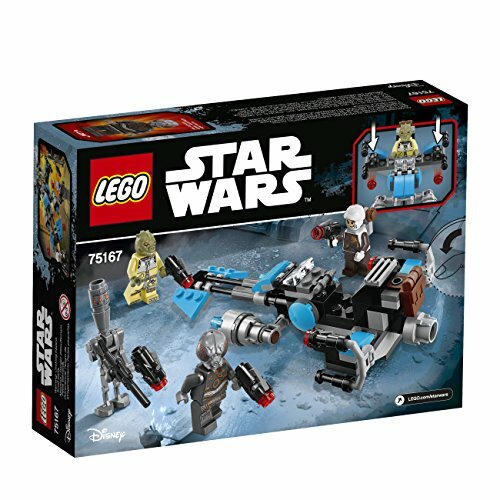 Buy the LEGO Star Wars Bounty Hunter Speeder Bike Battle Pack 75167 Building Kit from Amazon. Previous articleLEGO BrickHeadz Go Brick Me Building Kit (708 Piece) – Lowest Ever! Next articleHot Wheels 48- Car storage Case With Easy Grip Carrying Case Deal!